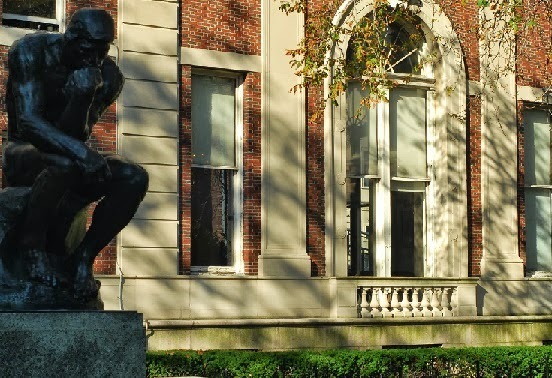 Rodin's Thinker at Columbia University. On second thought, do these opening words stand alone as poetry? With a new school year well underway we look at John Barth's The Sot-Weed Factor. Published in 1960. Originally intended as the last of a trilogy, The Sot-Weed Factor developed into something else entirely as John Barth (1930-) himself developed as a writer. First gaining acclaim as a National Book Award finalist for his first novel, The Floating Opera, Barth's style of writing was always hard to pin down to a specific genre, though post-modernism comes to mind. The Sot-Weed Factor (The Tobacco Seller) is a fictional tale based on an actual poem and poet — Ebenezer Cooke.